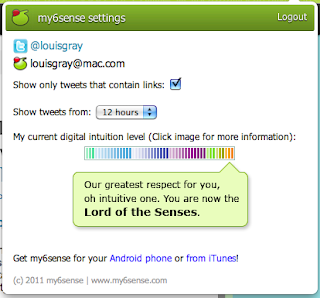 This morning, as you might have seen from one of the many places that covered the launch, my6sense took its first step beyond the world of mobile, bringing tweets ordered by personal relevance to Twitter.com, in the form of a Chrome Web browser extension. The idea, of course, is to take on the challenge of finding excellent content in your real-time streams and bringing it to the top. More signal and less noise. Working with a team that is small and has limited resources, we have to be smart about our choices, so it's my pleasure to talk about why this is such a big deal, and why we went this way. Tens of millions of tweets pour through Twitter every single day, according to the company's cofounders, and even through the most valiant efforts, you're bound to miss something, even after carefully hand-selecting those you follow, skimming fast and having great news sources. The idea is no longer a situation where "the news will find me", but instead that you are sipping from the firehose, and your limited time at the fountain means you are seeing select portions of the stream from the time of day you are looking. Meanwhile, in between the best stuff from all your friends and brands, there are a lot of updates that just might personally not be relevant. So something is needed. Even Twitter says "Our Challenge Is Relevance". We agree and we're hoping to help. I joined my6sense to help accelerate the third wave of the Web - personalization of streams from all sources, not just to bring apps to consumers. So it's no secret we've been talking since day one of the right way to come to the Web and bring my6sense to where people already participate. We don't want to build a dedicated Web site to compete with our partners and popular Web services, but instead, to bring the magic of our app to where consumers already are. There are two ways to bring the intelligence of my6sense to existing streams - one being through their adoption of the Attention API, which some are pursuing, or through other methods that we can initiate, like a dedicated extension that works by service or domain. Twitter, an incredible company changing the way people communicate, has to be selective in how it works with third party APIs, not choosing favorites, so we knew bringing this intelligence via extension was the right move. Browser extensions now exist for practically every platform - but are most well known for Firefox and Chrome. With the growth of Chrome's browser share, and the browser's overlap with our technology-savvy user base, launching on Chrome was the right idea. Also, starting with Chrome gives us a clear address on the Chrome Web store. No doubt, Firefox will be coming soon, resources depending. But what about the deployment? We knew we needed to make integration into Twitter.com seamless. From the first day we talked about this project, we wanted it to look and feel like Twitter. So our app simply adds a tab to the Twitter.com experience, and tweets are reranked based on user preferences. No fancy UI, just simple integration. Adding on support for URL expansion to preview articles and shared rich media, and we think we've brought real value to existing users without complicating their experience. If you understand our focus - to implicitly determine your interests based on those items you read and skip, or act on in the Twitter.com interface (such as favorites, retweets, replies, etc. ), you know we are trying to reduce the amount of time you spend culling through updates that aren't of interest to you. When people see the difference between the chronologically ordered timeline and the personally ordered timeline from my6sense, the difference is clear. Sometimes the stream may toss up surprises or items that aren't a clear fit, but no software is perfect. The good news is that we're listening to all the feedback, positive and negative, and hoping to make a real impact on the way we all consume and share content. I hope you'll try our new extension and see how we can improve your Twitter.com experience by bringing the best updates from your friends and brands to the top. You can find the Chrome extension at http://m6s.com/chromeweb. Disclosure: I am Vice President of Marketing at my6sense.